Replacing the IronMan 210 and 250 models, Hobart's new IronMan 230 is a 250-amp industrial-grade MIG welder featuring 12 voltage taps, up from seven, for improved arc starts and fine-tuning. 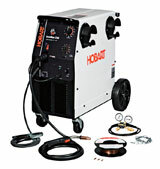 The single-phase, all-in-one welder is suited for welding mild steel material ranging from 24-gauge to half-inch. A more robust cast aluminum two-roll wire drive system replaces the plastic drive system. A patented hub design requires no tools to adjust for a variety of spool sizes, and supports the alignment of the spool and feed head.